That sounds very reasonable , i build a lot of stairways but 95% of them are built on the job site, i Have been noticing that there is a trend towards the modern type of stairway , I am in the process of opening a new shop and would like to start building more of the stairways there . We got the pricing wrong below. Extra manufacturing documentation for StairDesigner is priced at £27/project. The £17 figure is for Polyboard. By way of apology for the confusion, please accept a £10 reduction on the price of your first extra StairDesigner order if you ever need to access this. We figure that the Full membership 1 project/month service should suit amateurs who are working on a single project, and pros who only occasionally produce stairs. It offers a very cheap way to access the full functionality of the software without ever having to buy it. In comparison, businesses that are building multiple stairs/month are probably going to buy so the output is integrated, immediately available (and to avoid the extra charge). Even then, they can first use the Full membership StairFile Lite service to test things out and bed in the workflow so they are certain the investment is worth it. If there is a railing on the open side, it’s possible to design the stair so that the railing supports the outer side of the steps. This then makes it possible to balance the structural load on the steps and build the stair against a non structural wall. obviously there would have to be rails on all open sides , Probably 1/2″ tempered safety glass that is side mounted . These free floating steps are usually boxes which house steel bars inside that are fixed into the wall. The technique works well if the wall that the steel bars are deeply imbedded into a thick cement wall. However there is a safety issue with no handrail on the outer side. In France installing a stair of this type is highly risky as it doesn’t fit basic safety regs. and the fitter is held responsible for any accidents. You get one set of plans per month with membership. If you buy the pro version you of course get unlimited number of plans. Is the pro version only good for 1 set of plans? DXF export is not active in the free version of StairDesigner but is part of the free StairFile service for full members like yourself. Just send me your sd file and we’ll send you back the DXF files. How do I export as a DFX file : export function on stair designer is dimmed out ! Thanks for extracting the links Chris…. I think you will have to set up your stair with StairDesigner and edit the DXF files in CAD to get the wider first steps and detailing. Can you post a sketch of the stair so that I can understand better the design? it is like the first and second picture except that it is 15 treads straight up . I have been very busy of late , i will get something up in the next few days . the links are not showing up in your last post, can you post them again? You can’t build a stair with StairDesigner that has the first steps wider than the others. To do this you’ll have to export the DXF files into CAD and draw the flare and handrails onto the staright stair. If understand your project, you’ll be using a cut string with 7″3/8 rise and 10″ going using a 14″ you should have 8″1/16 under the steps which should be enough for 198″ support. For extra rigidity and especially if the stair is wider that 32″ you could add a central cut string. Could you post a drawing so we can understand the exact design you’re looking to build? These stringers are free standing , 198″ long , the 125″ rise makes for 16 steps and 17 risers , i need minimal deflection , would 2 1/4″ by 14 ” solid laminated birch be strong enough ? 7 3/8″ by 10″ for rise and run cut out of it . 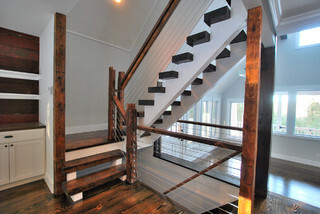 I have a stairway to build, straight set with cut stringers and open treads , the first 3 steps are wider than the rest of the stairway by 4″ , they have to accommodate a handrail , how do i go about that in stair designer !